I got some new materials to work with! Its billboard vinyl but its mesh. So the bags will be breathable. I immediately thought of making beach bags with this material and for me I need a new gym bag, so that will come soon. 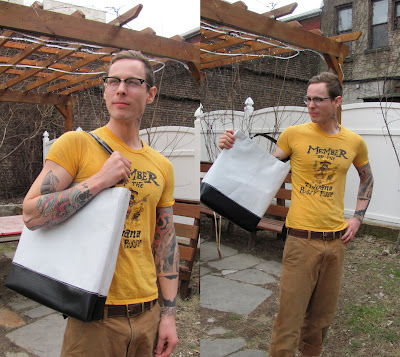 So here is the first mesh bag I made last night (although my model would like it to be called a "man satchel"). Its got a reinforced bottom so that no dirt can come through the mesh on the bottom of the bag and its of course got the cellphone pocket inside. 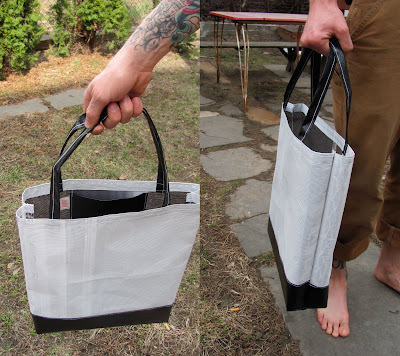 This is my version of the classic L.L.Bean tote bag. Fabulous and practical for a lady or man with satchel!